PHBKB Knowledge base provides you with the feature of auto saving articles in the "Autosaved Drafts" section. It automatically saves a copy of your article at regular interval of time so that in the event your computer crashes or connection is lost, you will still have a draft somewhere. 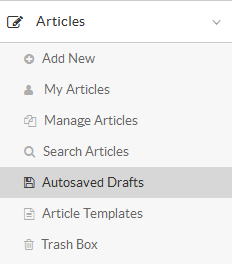 Expand "Articles" section in the left navigation bar and then click on "Autosaved Drafts" link to open autosaved Drafts page. ID: This column displays the unique ID number assigned to draft in the database. Title: This column displays the name or title of the draft. Saved On: This column displays the date when the article was saved in the drafts. Recover - Click to resume writing the article. When you recover the article, you are redirected to "Add Articles" page with draft details auto-populated. Delete - Click to delete the saved draft if it is not required. You can perform same action on more than one draft through "Select Bulk Action". For this, you first need to mark the checkboxes corresponding to drafts on which operation is required, then select operation from Select Bulk Action drop-down and click on "Apply" button. The autosaved drafts for existing articles (if any) will be displayed on edit article page above the edit form as shown in the screenshot below. Various versions of the draft are saved according to the date and time, when the article was modified. If you click on "Actions" button, a list of possible actions that can be performed on draft is displayed. Preview - Click to preview the contents of article saved in that version. Resume Editing - Click to resume modifying the article. It will reload the edit screen with the contents of that version. Delete - Click to remove that article version permanently from the autosaved drafts. In the case of article publish and article update, all the autosaved draft versions of that article will be removed automatically from the software.